Dealing with representatives of one or two of the cloth manufacturers in England in the past few weeks, we got to chatting about the history of the various brands. Talking with guys at Graham Browne and Anderson & Sheppard furthered that interest, but there seemed to be rather little information on the history of two of my favourites – W Bill and Smith’s – out there. So here’s what I’ve found. Unsurprisingly, it was founded by William Bill in 1846, in Chester Street, Mold. That may not sound like an attractive name for a town to non-Brits out there, but Mold’s a lovely part of Flintshire in North Wales. Originally the store sold welsh flannels and blankets, but when it moved to bigger premises in Tenby, the second William (Thomas) Bill introduced tweeds to the mix – now the brand’s most famous product. The tweeds were a great novelty after the broadcloths, serges and flannels and smoothly woven cloths then generally used. In London, tweeds and shepherd’s checks had become immensely fashionable since the opening of the Scotch Warehouse. The younger Bill moved to London in 1892, initially establishing two premises – one for knitted garments and the other for cloth – before combining them on Great Portland Street. Until 1988 the firm was run by descendents of William Bill. It provided wools and tweeds to the great and the good – Picasso had a jacket made from W Bill cloth and the firm supplied Shetland pullovers to both Sir Ernest Shackleton for the voyage to the Antartic in 1908 and to Sir Edmund Hilary for the first Everest expedition in 1953. Brooks Brothers and other American brands began buying from W Bill in the twenties and thirties, leading to a healthy export business. The war years, 1939-1945, whilst bringing in more orders, proved increasingly difficult in the conduct of the business. The small staff at Great Portland Street dwindled and there was the constant danger of falling bombs in London, and the possibility of the whole warehouse going up in flames. But all through the war, the blackouts and the bombings, the shipments to America continued. That paid off in the late forties and early fifties, when the Americans developed a love of cashmere. There were very strict regulations on its manufacture and sale, and W Bill was one of the companies licensed to sell to the export market. Many of the American servicemen returned home with cashmere sweaters. A new export-only shop was opened in South Molton Street and eventually a despatch department in South Molton Lane under the management of Ray Hammett. Ray is still there today, curator of the vaults at W Bill on New Burlington Street (see post from Thomas Mahon here). Growth, particularly in the US and further abroad, continued in the sixties and early seventies, but in 1975, the shop Gieves – next door to W Bill at 28 Old Bond Street was the first London building bombed by the IRA. It was the beginning of a downturn of American demand and business started to decline. In 1988, due to this and rent increases, the directors reluctantly decided to sell the company. It was taken over by Betterware Consumer Products, but only lasted another four years. In 1994 it was taken over by Smith & Co, who run it today. 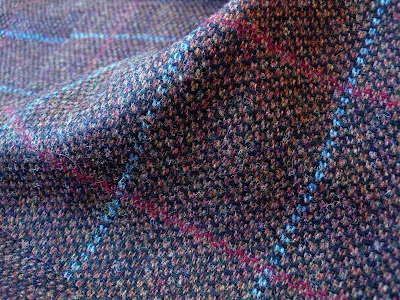 As Mr Mahon puts it, “they’re known in our business as THE tweed and cashmere specialists.” Still building on a reputation for quality that started with a small shop in Wales over 160 years ago. You can follow the discussion on The history of W Bill by entering your email address in the box below. You will then receive an email every time a new comment is added. These will also contain a link to a page where you can stop the alerts, and remove all of your related data from the site. Very enlightening…just acquired, from here in the USA, a striking vintage 1966 shawl-collar dinner suit, labeled “W Bill London W1” with the client’s name and date handwritten. Very little padding in the shoulders, natural, the suit is soft and drapy rather than structured. And I might add, fits me beautifully. But the actual tailor is a bit of a mystery. Perhaps W Bill had a bespoke operation at one time? Certainly looks like Savile Row, with handmade buttonholes, surgeon’s cuffs, etc. Thoughts? My father only bought his cashmere sweaters at W. Bill in the 50s and 60s. He brought me to the shop in ’69, and it was a treat. Sorry to hear of its sale to Smith. I remember the shops in Bond Street well – yes, they did have their own tailor (Mr. Brews??) who made wonderful suits. I have a jacket / skirt suit from the ’70’s – and my husband a suit from 1987.. Working on a social history project here on the Isle of Harris Western Isles Scotland I was given a ledger of a shop based in a small settlement called Kyles which supplied W Bill Woollen 31-29 Great Portland St London with Harris Tweed in 1928. It’s fascinating to read of the development of the business. One of the W Bill family lived in Montecito, CA and ran a very nice, British shop for men and women. His son is a contemporary of mine (~75) and I presume still resides there.